In sports, there are rules to be followed, for the god of the game and for the good of the athlete. In medicine, rules are few and far between. Instead there are guidelines that as the term implies, guide the physician in the care of a patient. Sometimes, athletes treat rules like guidelines, situationally bending them, hoping to seek an advantage. Sometimes, doctors rigidly adhering to guidelines, forget that bedside skills may be more important than following an algorithm. And sometimes, the two worlds come together for a teaching point. During the second period of the American Hockey League game Springfield forward Wade McLeod hits his head while being checked into the boards by Brandon Manning of the Adirondack Phantoms. Boarding is against the rules in hockey but it is a hard call for the referees to make because of the speed of the game. Was it a penalty because the hitter that drove the player into the boards or was it the momentum of the hittee, making the collision unavoidable? A penalty was called but it was perhaps the best penalty in the career of both players. After bouncing off the boards, MacLeod suffered a seizure and was taken to the hospital for further evaluation. Post traumatic seizures are not uncommon. The brain gets rattled inside the skull affecting the electrical patterns in the brain. Every brain has a seizure threshold, meaning that there is a possibility for outside forces to cause a seizure. In infants and child4en, that threshold is rather low and high fevers can commonly cause a child to seize. As the child grows, the threshold rises and the risk of febrile seizures decreases and then disappears. Some people have continued low threshold, develop lifelong seizure disorder and need medications to raise the bar to prevent recurrent seizures. Each part of the body is controlled by a separate section of the brain and controlled electrical impulses within the brain allow purposeful movement. When the electricity short circuits, the brain doesn’t particularly like it and turns off, the electrical activity stimulates body parts to move and you get the classic unconscious, convulsing patient, rigid, arms and legs twitching, responding to all those brains signals. And just like a computer that locks up after being dropped, the brain needs to reset itself and reboot. During this time, the post- ictal (or after seizure) phase, the patient gradually wakens but has a hard time processing information, just like the computer. When the flag or apple is waving on the screen, the computer isn’t ready to receive information regardless of how fast or hard you type on the keyboard or click on the mouse. Same with the brain; waking up and responding to the surrounding world needs to wait for the brain to wake up. Mr. MacLeod is taken to the hospital where a brain CT scan is done and reveals a benign brain tumor. Perhaps it wasn’t the hit into the boards and concussion that caused the seizure but rather this underlying structural problem of the brain that had gone unnoticed and the boarding penalty was just a coincidence. But why was the CT ordered? 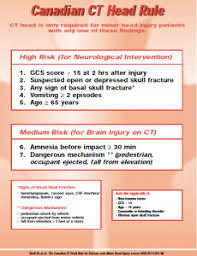 The head injury guidelines specifically mention that imaging the brain after a concussion is not warranted unless the patient is not fully awake, has evidence of skull fracture or has persistent vomiting. Had the doctors caring for Mr. MacLeod followed the letter of the Ottawa Head CT Rules or the Zurich Statement on Concussion, the CT likely would not have been done, but it was the bedside evaluation, the hunch that something was not just right, the intuition that develops with experience that caused the brain scan to be done and the culprit tumor to be found. Watson, the IBM supercomputer Chess and Jeopardy wiz, is being upgraded to practice medicine and will likely be more efficient in making diagnoses and recommending treatments in most situations. It can crunch numbers and follow all the rules, but as is often the case, the best doctors know when to ignore the guidelines because of bedside experience. The on-ice seizure was frightening but the seizure was likely due to a structural problem in the brain and not the hit into the boards. Timing is everything. Imagine if the seizure would have struck a couple hours earlier or later while Mr. MacLeod was driving his car. While the hockey game was suspended after MacLeod was taken off the ice. The doctors got the win that evening because they remembered that guidelines are not rules.